Pinch Harmonics Masterclass… Make Your Guitar Scream! Home / ask james guitar show / Pinch Harmonics Masterclass… Make Your Guitar Scream! Just Like Your Favourite Rock and metal Guitarists! The scream of pinch harmonics is a characteristic part of modern rock and metal guitar playing! But how can you get ’em? In this guitar lesson you’ll learn exactly how you can get sceaming harmonics from your guitar – just like you hear in the playing of Randy Rhoads, Steve Vai, Slash, George Lynch…in fact nearly every major rock guitar player heard today. Get Your Free ‘Pinch Harmonics Guide’ Featuring Full TAB For This Lesson! DOWNLOAD YOUR FREE PINCH HARMONICS GUIDE HERE! Want to nail pinch harmonics? In this guitar lesson you’ll learn how you can master this essential tool for rock, blues or metal guitar. Discover correct technique, tips for getting them whenever you want, awesome harmonics licks you can use use in your solos and exercises to get you on the road to pinch harmonics mastery! 1:02 What are pinch harmonics? Hear what they sound like and learn how and why you might want to use them in your solos. 1:40 How you can consistently get them in your playing (so that they sound big, fat and punchy!). The technique might sound simple, but it does take a little practice to master. You’ll probably find them a bit ‘hit and miss’ to start with but by following these guidelines you’ll soon be ripping them out whenever you want. 2:40 Technical tips for effortless ‘squealers’ whenever you want them! Where you pick the string and how you’re holding the pick can make a big difference. We cover this and more in this section of the lesson. 7:12 Adding vibrato to harmonics (here’s the secret to making them sound truly awesome…). It’s when you ‘shake’ pinch harmonics that they really start to come to life. This is what gives them that lyrical ‘scream’ that we hear in the playing of guitarists like Zakk Wylde. Check him out, he’s possibly got the most aggressive pinch harmonics out of any player out there! 8:00 Bending strings with pinch harmonics (for high energy rock and metal licks which will really turn heads!) Adding a harmonic to a string bend adds a whole new sound to your ‘bending toolbox’. Check out some tips and techniques here. 9:20 Three licks for pinch harmonic practice and to use in your guitar solos. 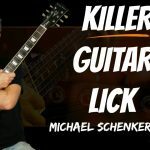 These licks are coming from the A minor pentatonic scale and give you some cool ways to integrate harmonics into your solos. Try them out over a backing track in A minor to see how you can get them to work. Get Your Free ‘Pinch Harmonics Guide’ and Exclusive Members Only ‘Video Powerpack’!